What do you do when your four year old son requests a dinosaur and volcano cake for his fifth birthday? These are a few of the options. Do you. . .
hide under your covers and pretend you heard nothing? run to the nearest store and order a cake for a lot of money? 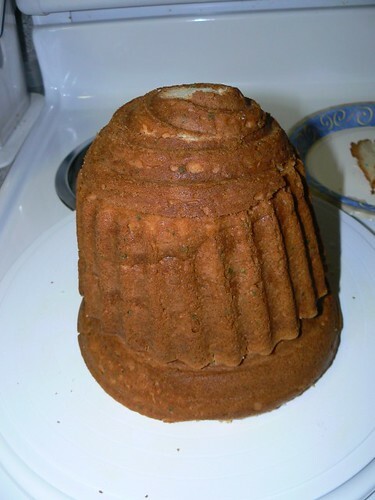 search on Google for volcano cakes and get fabulous ideas in your head? 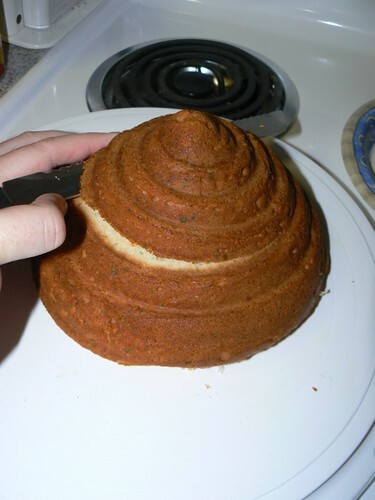 Here in Angel Land, I immediately envisioned using the giant cupcake pan to make said volcano into a reality. I most definitely did a Google search to see what others before this had done. Did I have a clue what I was going to do beyond that? Not really, I am quite good at making things up as I go. Of course JL and I bounced ideas to each other and I even opened it up to people on Twitter for thoughts. In the end we opted to use the giant cupcake. I figured in order to make it more of a volcano shape I had to use the bottom as the top, and the top as the bottom. Got that? I am serious, the shape of the cupcake flipped around like that could quite possibly work. You will see how it worked in the photos below. Yesterday we went out and bought the cake mixes (yes I cheat that way), frosting, red icing for possible lava, and Fruit by the Foot (another possible lava although no strawberry was to be found). 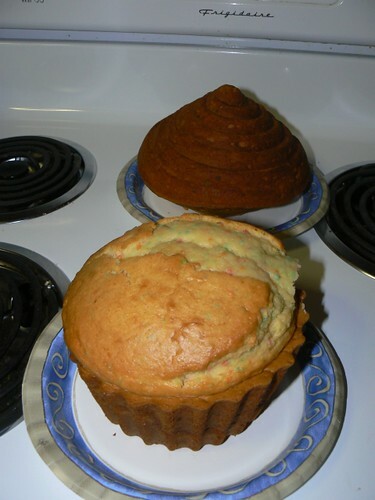 After the kids were in bed JL and I baked the giant cupcake and eight little ones with the remaining batter. This morning, after leaving the cake the chill during the night, I set out to create the volcano. Here is the giant cupcake before anything was done. 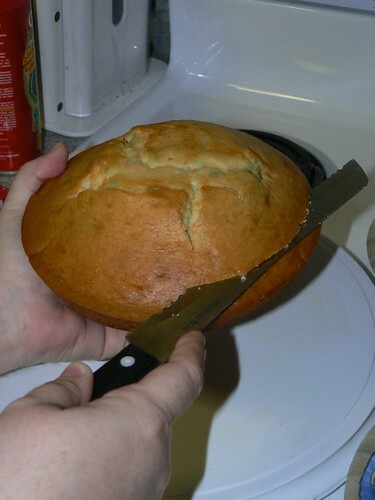 Next it was time to cut off excess cupcake that was not needed for the volcano. Please note, no fingers were lost in the making of this cake! Soon we realized that the bit that was taken off the top of the original cupcake would make a perfect topping for Mount Dinocake. 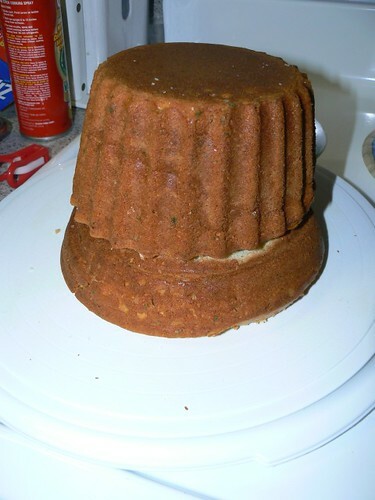 The construction was complete and it was time to decorate to really make this cake look like a volcano. Those photos will be shared later on. Sorry for the tease, but it is time to get the troops ready to head out. Today we are taking NHL and his friend I. out for a birthday celebration. NHL selected a spot that he wanted to go to and after that we will likely head out for pizza together, followed by cupcakes that I baked. The real Mount Dinocake will be made next week for our family party on NHL’s actual birthday in a week. « It’s raining, it’s pouring . . . This is SO clever and I’m totally stealing…ahem…I mean, borrowing this idea for our next celebration – thanks!